Home » Healthy Eating Blog » The Ultimate Cholesterol Lowering Plan© online Shopping Tour video launch - rundown and summary of the event! 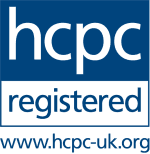 This is a fabulous resource that has been put together for National Cholesterol Month via an educational grant from Heart UK, Waitrose and Alpro UK. The evening was an educational one which finished with a viewing of the new video. I was able to provide lots of tweets, during the event, for those of us who are on Twitter (with the hashtag #UCLP©) but I thought I’d write a summary of the sessions for those who missed out, or who aren’t big on tweeting! Linda Main spoke about the problem of heart disease in the UK, looked at the risk factors for heart disease, including dietary factors and then discussed how adults in the UK are measuring up against health eating recommendations for the prevention of CHD. She then went on look at the Ultimate Cholesterol Lowering Plan© as the most up to date plan combining the best features of dietary recommendations with the strongest evidence base. October national cholesterol month, the challenge is on to reduce cholesterol. Heart Disease is the single biggest killer in UK. 80% cases could be avoided by improving lifestyle (World Health Organisation 2003). More than half of adults in UK have raised blood cholesterol! Cholesterol levels are determined partly by our genes. There are 120, 000 people in UK with familial hypercholesterolaemia. The modifiable risk factors for cardiovascular disease, (CVD), are smoking, hypertension, diabetes and raised cholesterol. Is obesity a driver for cholesterol? It depends on fat distribution. Among equally obese patients, subjects with an XS of intra-abdominal (visceral) adipose tissue have the worst metabolic risk profile. We need to focus on “waist loss” rather than “weight loss”. 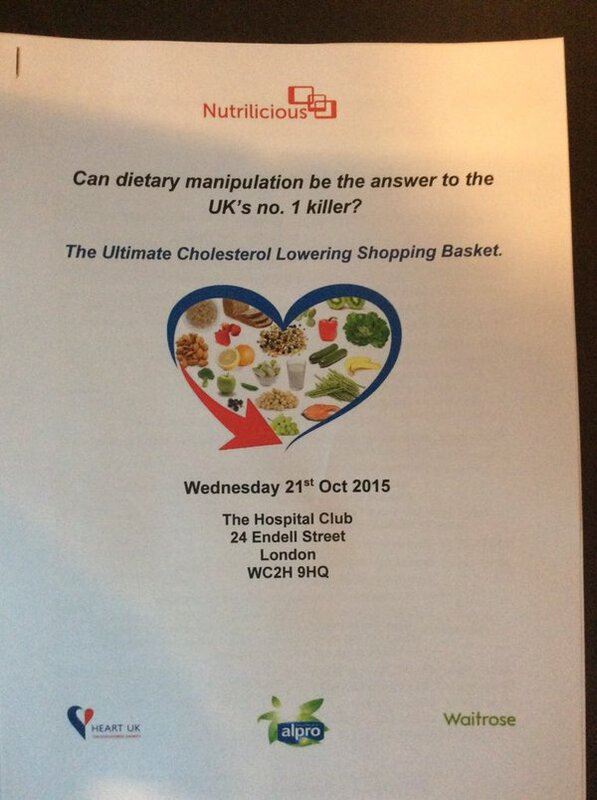 Is UK meeting nutritional targets for prevention CVD? The national diet and nutrition survey for 2012 results say NO. The national diet and nutrition survey for 2012 revealed more than 50% UK adults failing to meet “5 a day” target for fruit and vegetables. Wholegrains recommendation and oily fish target (140g) per week also not being met by UK adults. People following a plant based diet were closer to achieving dietary targets- (or, indeed, met them). In the Welsh Health Survey 2013: – 58% of adults were classified as overweight or obese, including 22% obese. In the Welsh Survey, 33% adults reported eating 5 or more portions fruit/veg the previous day. 8% adults ate NO fruit/veg on the previous day. Call to Action: We need to lower cholesterol through diet. Dietary recommendations for lowering cholesterol have changed over time and with changing evidence. The most recent with strength of evidence – the Mediterranean diet and the Portfolio Diet (Jenkins). Dietary recommendations have traditionally excluded any mention of motivation and support for clients. The Ultimate Cholesterol Lowering Plan© is a realistic, flexible, practical and evidence based plan which includes all of the above. There’s a perfect plan to help tackle UKs no 1 killer. Let’s share this. The Ultimate Cholesterol Lowering Plan© is made up of three steps – step one: setting the mood – motivational Interviewing/client empowerment- step two: establishing a healthy foundation diet and – step three: adding the 4 cholesterol busting foods- nuts, soy based products, plant sterols/stanols and soluble fibre containing foods including oats and beans/pulses. The Ultimate Cholesterol Lowering Plan© has produced some brilliant FREE resources – some for consumers and some for health professionals. Consumer resources include: consumer leaflet, 8 fact sheets and recipes. There are FREE. Health Professionals’ Resources include: online training, UCLP© report and beautifully printed and illustrated client “tear off pad” resources. And of course, for national cholesterol month, the new store tour video being released during the event. “Saturated fat: controversies, myths and a confused public. It’s time to set the record straight”. Diet may just now be “top of the tree” for CVD risk even pipping smoking as the main risk factor. Professor Griffin agrees with the Cholesterol/Lipid hypothesis – lowering LDL, direct effect reducing CVD events and raised serum cholesterol is related to coronary heart disease. The history of diet/cholesterol studies goes back to 1950’s studies where there were studies in ward settings using rigorous control of dietary fatty acids. Several studies have shown that reduced saturated fat and increased polyunsaturated fatty acid rich foods – great effects reduction LDL cholesterol and risk of deaths from CHD. There has been a changing body of evidence and fallout in the form of public confusion. Recent contradictory studies, for example, the recent Am J Clin Nutrition 2010 meta-analysis of prospective cohort studies evaluating association of saturated fat with cardiovascular disease which concluded no significant evidence that saturated fat is associated with coronary heart disease. The problem is that meta analyses have limitations – such as study design (data polled from prospective cohort studies and not randomly controlled trials, there is no account of effects of substitution (such as with type of unsaturated fat or with carbohydrates), differential effects of different saturated fatty acids on LDL cholesterol and the importance of food source has not been taken into account – no account for variation in effects of saturated fatty acids in different foods. We cannot measure the absolute effect of saturated fat. Source of saturated fat is important as is the fact that we eat whole diets NOT single nutrients. Despite saturated fat controversies, science is strong for replacing saturated fats with unsaturates. There are other effects of saturated fat to be considered as well,(not just about cholesterol), there is the impact on liver and visceral fat and vascular integrity. Prof Griffin’s conclusion – When reviewing credible science there is no controversy – we should replace saturated fats with unsaturates. Mainstay recommendations need to be on foods and dietary patterns. “Influencing Behaviour change at point of purchase”. When looking at nutrition and health advice, “Knowing isn’t doing”. The problem is changing behaviour. Evidence shows patterns of behaviour are deeply embedded in people’s social & material circumstances, & their cultural context. Change must be important to the individual and they must feel confident in their ability to undertake that change. Coordinated attempts to promote or support behaviour change can take a number of forms and be at different levels. Where can we reach the public? This can be on the policy level, individual level or via social campaigns- some interventions include: policy changes (legislation, workplace policies, industry agreements), school food standards, WHO and SACN recommendations, advertising and labelling and taxation. Other specific interventions – one to one advice, group teaching, social marketing, (change for life campaign or store tours), nutrition on the national curriculum, national health days or months, technologies such as health apps, store promotions – healthy living, point of purchase promotions. Looking at point of purchase promotions in grocery stores – Lucy looked at a number of health campaigns such as the Healthy Kids campaign 2012, health labelling and vegetable campaigns point of purchase information which demonstrated increased purchases of healthy items. When asking shoppers their views on foods available at point of purchase – recent DOM UK survey revealed – nearly 8/10 shoppers unhappy with sale of sugary/high calorie food and drink items at checkouts, 78% find having junk food at the checkouts ‘annoying’ but “hard to resist”, 83% have been pestered by their children to buy junk food at the checkouts and 75% have given into their children and purchased something due to being pestered. In fact, over 90% in the UK survey think that junk food at the checkouts contributes to obesity and 56% said they would be more likely to shop at a supermarket if they banned junk food from their check outs. When shopping for health and food advice – consumer trends are changing. More and more are shopping for food online and more and more people are turning to internet and stores for health advice. A 2013 survey in UK showed that 51% of people are going online for health and nutrition advice compared to 23% obtaining their information from the media and 22% from GPs. The Ultimate Cholesterol Lowering Plan© Online Supermarket Tour is a resource which capitalizes on all of these trends to provide a practical, online behaviour change intervention. The Ultimate Cholesterol Lowering Plan© provides achievable food based recommendations and the Supermarket Tour offers the public practical advice on how to adopt these recommendations. Lucy then ran the clip of the Supermarket Tour – it was just the right length, easy to understand, practical and realistic. All in all, it was a great night. I love the supermarket tour and all of the Ultimate Cholesterol Lowering Plan© resources and use them in my work with clients. I hope I have been able to summarise the main points for all of you who were not able to follow along on twitter! Please note this is a sponsored blog. Tags: Cholesterol, Ultimate Cholesterol Lowering Basket©.